These two cards are designed to be simple, stylish and very modern with centrally mounted square board, featuring a little star shape and two bound ribbons. The ribbons are held together with a central pearl effect buckle and this card is finished with a beautifully hand tied bow. I have used a fun and childlike styled font to complete this new baby card! 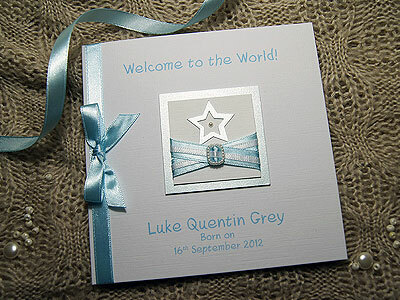 I was keen to create a new baby card that was fun and cute, but still quite stylish. Since it has been released it already seems quite popular, but I am always keen to hear your thoughts and opinions! ?